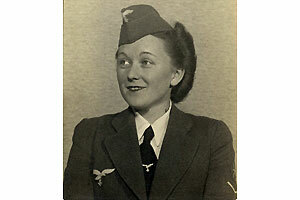 A 'Blitzmädel', a female emplyee of the Luftwaffe who were assignes e.g. as Luftnachrichten-Helferinnen at radarstations. Part of the station may have looked like this. Elements of the electronic equipment of a Würzburg Riese antenna. 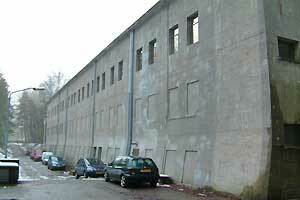 The eastside of the colossol bunker 'Diogenes' near Arnhem. The purpose of the radarstation was to contribute to the interception of passing Allied bombers and fighters. As described earlier, it was part of a extensive system of radarstations in Western-Europe. The reflecting properties of radio waves were discovered by a German in 1886-1887. These properties were used by radar for determining direction and distance of objects. This use was also discovered in America in 1922 and since 1934 employed by the war parties for air defence and at sea. Back then it was a modern technique of which the application was speeded by the threat of war and the war itself. 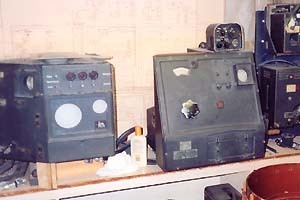 The radarstation 'Seeadler' was a probably a FuMG-stellung (Himmelbettverfahren), type Funkmeßgerät Stellung, with the specific task to guide fighter planes, stationed at Schiphol and Bergen, to their targets. The two parabolic radar antennas of the Würzburg Riese (7.4 mtr diameter) type made it possible to follow an enemy airplane each at a distance of 70 kilometres. The two tracking towers could track two fighter planes. The Freya antenna provided early-warning up to a distance of 120 kilometres (at a height of 8.000 metres). The fighter planes themselves were gradually equipped with their own board radar from 1941 on. 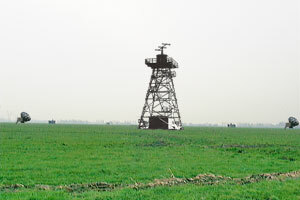 The Dutch radarstations were part of the 1.Nachtjagddivision, since 16 September 1943 3.Jagddivision. Its headquarter was in the Grossraumgefechtsstand bunker 'Diogenes', north of Arnhem, were all observations were gathered and attack plans prepared. The Luftnachrichtenregimenten (Ln.-Rgt.) 201 en 211 manned the radarstations in The Netherlands. Because 'Seeadler' probably was manned by a Mittlere Flugmelde Leit-Kompagnie. After a reorganisation at the end of 1944, after the closure of 'Seeadler', only the Ln.-Rgt. 223 exisited. Resistance intelligence mentions no more than 100 men in the colours (Waffengattung/Waffenfarbe) of the Luftwaffe Funktruppen. The technicians and guards, possible 50 men, were housed in barracks on the station itself. For the construction of use were Ukrainians and Armenians employed. They were housed in the R.C. school in nearby Muiden. a USAAF P-47D Thunderbolt of 359th Fighter Squadron, 1st Lt. W.H. Beach near Vreeland on November 29th, 1943. Additional information is not available. Also reports from the area west of 'Seeadler', the area of Amsterdam, are not known. It will probably never be known if 'Seeadler' played a role in any of these incidents.